Once I found out I had a reservation to camp at Havasupai I knew I needed to add on some extra time to see some of the other beautiful places nearby. I consulted with my Havasupai crew and none of them seemed to have extra vacation days to spare, so I started planning an epic solo trip to see as much of the surrounding area as possible while only taking three extra vacation days. Well, I planned that epic solo road trip and then another friend asked if she could tag along because it sounded fun…and I was like HELL YEAH! I am pretty good at doing things solo because I am an only child, but having a friend to share the experience seemed way more enjoyable. We made some edits to my original plan so I could get her back to the Vegas airport before I departed for Havasupai. It was more driving, but it ended up working out great because I was able to pick up some of my Havasupai group and split the rental car cost! We landed around 9pm on Wednesday and picked up our rental car to start our long drive to Kanab, Utah. 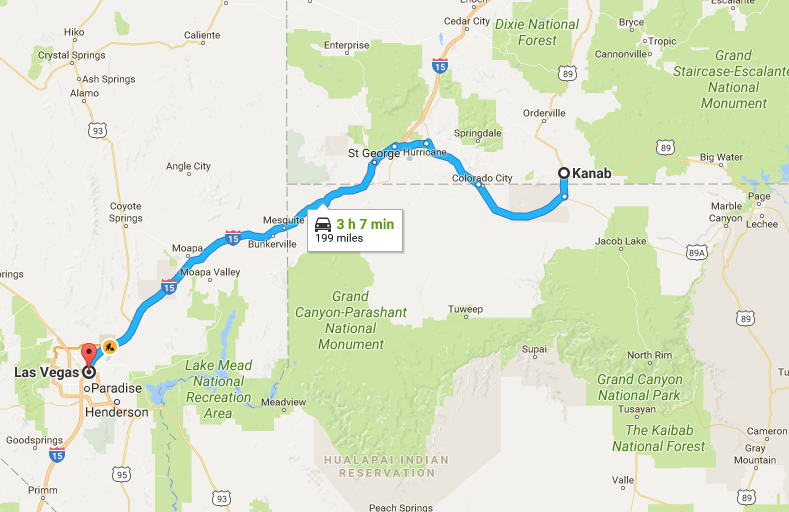 Originally I had us staying in St George but we switched to Kanab because it was right in the middle of everything we wanted to visit. It’s also a 3.5 hour drive from Vegas through a whole lot of nothing, especially if you are driving there in the middle of the night like we did. I drove the first leg of the trip and felt really fortunate that we were surrounded by thunderstorms the entire way to Kanab. You could see the lightning flashing all over the place in the distance and it made what would have been a very boring drive seem magical and a little eerie. I also have always had a strange obsession with thunderstorms. I generally take them as a sign of good luck, this one seemed especially lucky since it was timed with the start of the trip. Around 1am or so we rolled up to our hotel and passed out. After waking up early and packing our daypacks for our visit to Zion, we made a short drive to The Wave Permitting office to try our hand at the lottery for the next day. We arrived at 8:30 to put our names in the hat and they started the lottery at 9am. Unfortunately we were unsuccessful the lottery. After some consolation coffee from a local coffee shop we made our way to Zion National Park. When we arrived around 10am there was a major thunderstorm and water was streaming off the canyon walls. When I planned this trip the only major thing I absolutely HAD TO DO while in Zion was hike Angels Landing, with the weather looking the way it was I wondered if that would even be possible! I started seriously doubting my previous, “Thunderstorms=Good Luck” mindset. We parked our car at the visitor center and took the required shuttle bus down the scenic drive. I wanted to wait till it dried out a little bit to attempt Angels Landing so we got off at the Lodge Stop and wandered around the Lower and Upper Emerald Pools. Seriously moody skies over Zion! Once the sky started to clear up we kept walking on a trail that led to The Grotto where the Angels Landing trail started. The sky had cleared up and it had definitely gotten much hotter. The first part of the trail up the switchbacks was a sweaty affair. Once we reached the top of the switchbacks and the trail narrowed out to the sketchy portion with chains the wind started picking up like crazy! This was the first time I really had to battle extreme panic on a trail. I realized slightly too late that the tread on the hiking boots I had packed was worn down a little too much. The wind kept whipping my hair into my face making my visibility not the best. Every time I looked over the side I would get a rush of vertigo. After a few minutes of this I seriously considered quitting. My panic was making me a little nauseous, and I wondered if I was being wise to ignore the "don't hike in high winds" signs posted along the trail. The friend that I hiked with seemed to be handling it fine, so I attempted to calm myself down and keep pushing forward. It's hard sometimes to tell the difference between fear that is holding you back and fear that is keeping you safe, in this case my fear was definitely holding me back. I am glad I pushed forward and fought it. So narrow. So much wind. So much panic. Once at the top I set up my tripod to start taking photos. This is always a strange experience for me in a crowded place. I don't want to always hassle my friends to take photos, but I also get a ton of weird looks when I am wandering around with a remote taking photos of myself! After I took a few test shots a stranger wandered down to ask me if I wanted to do Acro-Yoga with him for pictures. Since we were surrounded by thousand foot cliffs that was a solid NOPE from me. As he was talking to me a thunderstorm suddenly opened up above us and the flash flood alarms went off in the canyon below. Cue another round of panic from this girl! I rushed to pack up my tripod and camera only to discover a fat squirrel had chewed it's way through the drawstring on my daypack. I attempted to macgyver my backpack shut without it (poorly) before meeting back up with my friend and rushing down the trail. Everyone that had been at the top of Angels Landing when the storm started was making their way down at the same time so it was slow going but eventually we all made it safely to Scouts Lookout. At that point the storm had died down so I wondered if we even needed to rush away from Angels Landing, but I guess better safe than struck by lightning on an exposed cliff! What a difference 30 minutes can make in the weather! Mentally I was pretty exhausted after this. We got back on the shuttle and rode it to the final stop. We were considered hiking down The Narrows, but I must admit I was really relieved when I saw a sign saying it was closed due to flash flooding. My brain and body just wanted a break after all the panicking on Angels Landing. We did the riverwalk to the end then made our way back onto the shuttle and into Springdale for dinner. The river was definitely high and muddy from all of the earlier storms. A taco salad and a horchata the size of my head made me feel much less exhausted so we rushed to hike the Canyon Overlook trail for sunset on our way out of the East entrance of the park. I hiked as quickly as I could to the overlook, but we slightly missed the sun dipping below the horizon. It was still a gorgeous spot to end our day trip to Zion though, and it definitely made me feel like I squeezed in every last thing I could have possibly done in the time I had there! Glyder Apparel was kind enough to send me some pieces to try that I wore during my day in Zion. My favorite piece was The Base Hoodie in white. It was a perfect lightweight layer to wear in a desert that couldn't decide if it wanted to be sunny or stormy. It also didn't attract dirt and smells as much as I thought it might! I brought a couple of other hoodies for my trip but ended up only wearing this one! I will definitely be wearing this a lot during fall in the PNW! They also sent me their elongate legging in cracked onyx and the Fly High Bra in cracked oynx. The leggings are definitely good high quality and pass the bend over test. The sports bra had nice mesh detailing the front that also doubled as secure place to put my phone while hiking down Angels Landing in the rain! Definitely check out Glyder Apparel if you haven't! They were kind enough to provide me with a discount code if you are looking for some new activewear. Just enter in SEATTLEBRED20 at checkout for 20% off your order! 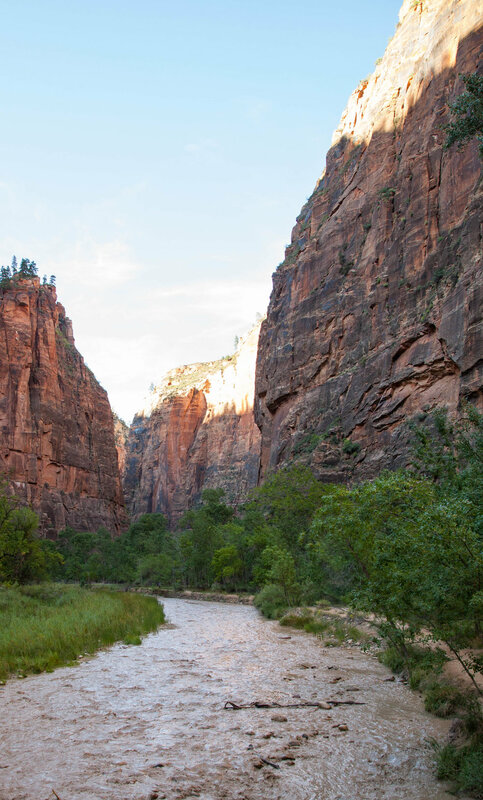 Who else has only spent a day in Zion National Park? What was your itinerary? I definitely want to go back and see all the places I wasn't able to visit this time around! If you are looking for a longer trip in Zion National Park check out Little Grunts’ guide on backpacking the Zion Traverse!